Congratulations to our friend and neighbor, Eddie, for fulfilling a lifelong dream of opening a not-for-profit community theater. Eddie has been active in the theatrical arena for over 40 years. He taught English, writing, speech TV broadcasting and theater for 33 years at our local high school. Both our daughters have fond memories of Eddie’s classes and theater productions. 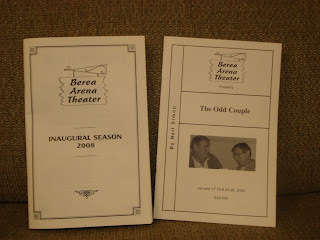 For nearly two years, Eddie and his wife, Norma, have been working on the creation of this theater. A suitable location was obtained through the generosity of the local college and volunteers spent six months renovating, cleaning, etc. Eddie is the Managing Producer/Artistic Director. The first production, being presented for two weekends, is the Neil Simon play, “The Odd Couple.” Friday night our family thoroughly enjoyed the performance starring several familiar folks from the community including Eddie and Norma. Five main stage productions are scheduled to be presented during 2008. Additional theatrical events may include stand-up comedy, movie nights, concerts, youth talent nights and children’s theater. Thanks to the hard work and dedication of Eddie and Norma, we look forward to many fun evenings of local entertainment!